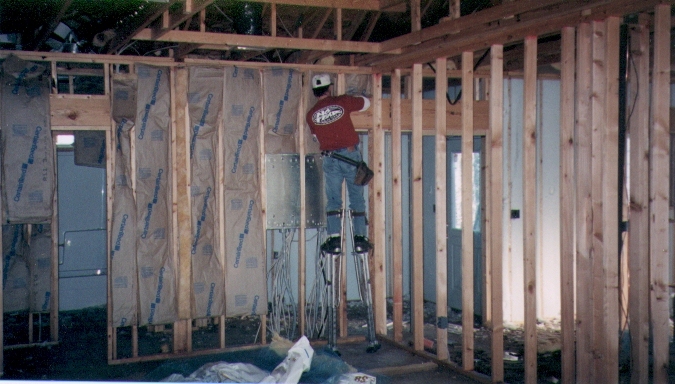 Some builders use 2"x6" studs in order to get more insulation. We read that in the mild Arkansas environment, the payback time in energy savings for the additional cost of using 2"x6" instead of 2"x4" would be too long to be worth it. Since most houses in HSV have lots of big windows to take advantage of the wonderful views, the greatest area of heat and cooling loss will be the windows, not the walls. Roger Craft (our builder) also recommended 2"x4" studs, so that is what we went with. 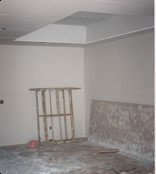 One exception was that Craft used 2"x6" studs in the walls with 20' ceilings. But this was done for structural purposes, not for added insulation. 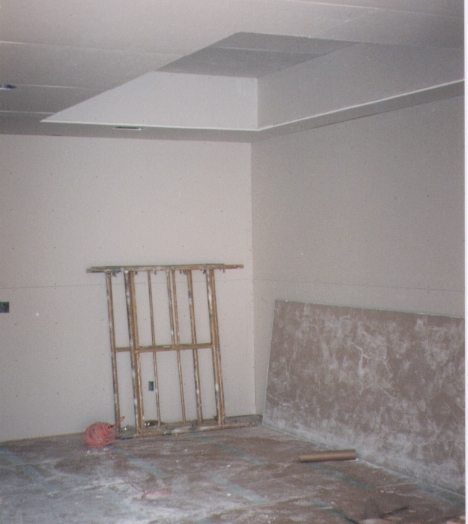 At Judy's house, Jim Buss also used 2"x6" studs in one wall -- the "wall of windows" which, due to the windows, had far fewer studs than normal. Buss also had a huge header beam across the entire expanse of the wall of windows for additional structual support. One advantage to 6" studs which should be mentioned is mounting window blinds. With 4" studs, there probably will not be enough room if you want to have inside-mounted window coverings. 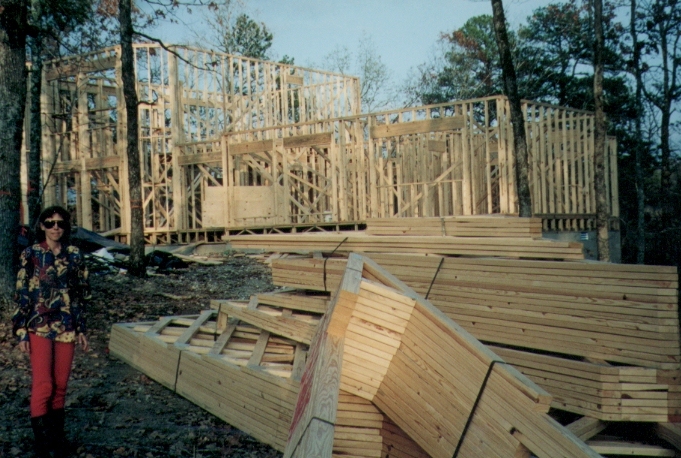 Most builders use factory-built trusses for the roof. This may save time and money, but cuts down on usable attic space. 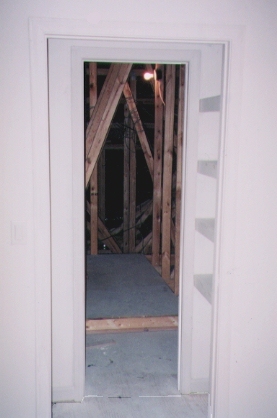 Since in HSV you have a lot of under-house space, attic space is not as important as where we came from (Houston). 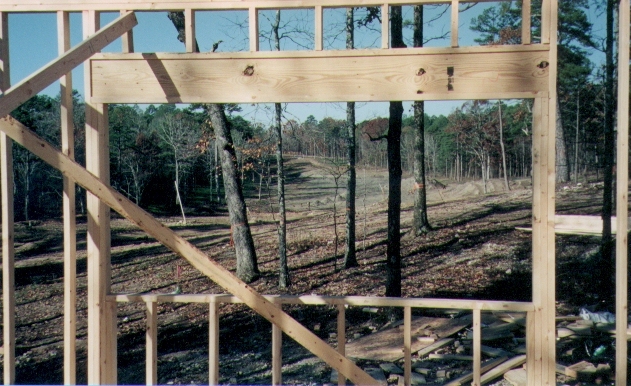 Judy's builder, Buss Construction, did not use factory-built trusses, possibly because her roof line was much simpler, or possibly because Buss wanted to conserve attic space. 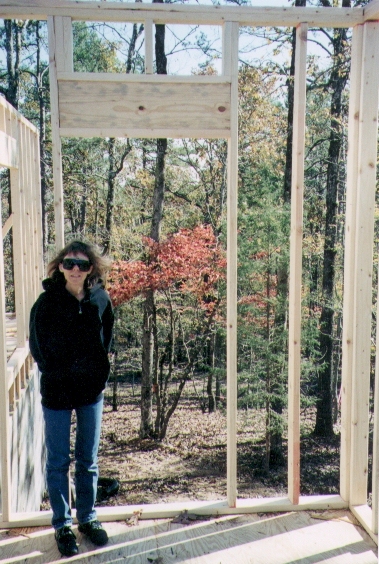 My plans called for a step-up ceiling for the dining room, so Craft ordered the roof trusses already framed for that. All that had to be done was to apply the sheetrock. Some friends using a different builder wanted a trayed ceiling in their dining room, but the builder forgot when he ordered the trusses and then wanted to slope the sides down from the ceiling instead of stepping up from the ceiling, as our friends actually wanted. 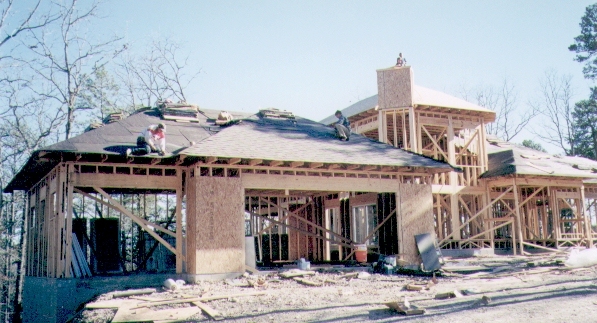 For some features of the roof/ceiling, it is easier for the builders to order standard roof trusses and then modify them. For example, we had specified a small area in the attic cleared of roof trusses and accessible by a door from the loft which could be used for storage. 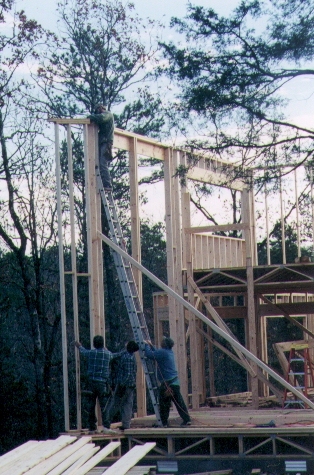 It was cheaper and easier for the builder to order standard trusses and rework them to clear room for the storage area than to try to get the trusses made with that space cleared. Other examples would be space through the trusses for a skylight or an interior chimney. 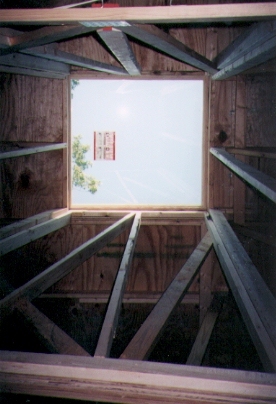 It is easier and more accurate to cut and reframe around such openings needed in the standard trusses than to try to get them cut to exact specifications. Once the studs are up, you have your last good opportunity to make major changes, such as moving doors, adding windows, or putting in a large skylight, at relatively mimimal cost. For example, we added a window in a bedroom where we didn't have one planned because we had no way of knowing during the planning stage what kind of view we would have at that spot. Perhaps more importantly, the extra window opposite the bedroom's larger windows allows much needed cross-ventilation at night when we leave the windows open. Had we not been checking on the building every day, we would have missed the chance to add this important window. 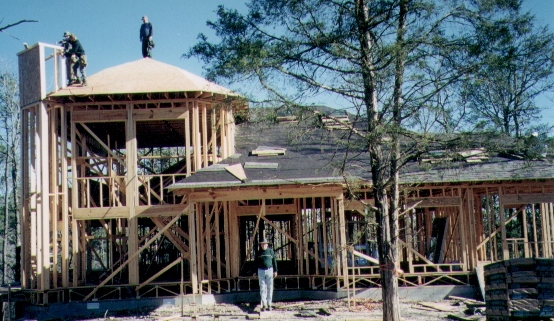 Once the framing is done, the roof goes on. Until then, the plywood decking on the floor is exposed to the elements and rain caused some of the plywood to buckle or delaminate. When we asked Craft about this, he assured us that after the wall sheathing went up, any damaged plywood decking would be replaced, which it was. Most of the pictures here don't show the detached garage. 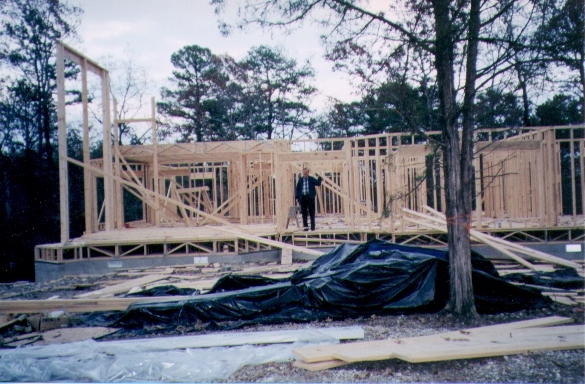 Here's one that shows the garage, just to let you know that it is going through the same process as the house. An attached garage is more cost effective because it can share a wall or two with the house, but we could not have had an attached garage without sacrificing views.